A company known today across the global amusement business for its innovative debit card payment technology, Sacoa Entertainment and Playcard System, got its start half a century ago as a result of a chance encounter at small coffee shop in Argentina. Company founder Mauricio Mochkovsky was taking a break from his struggling business as a construction subcontractor in Mar del Plata, Argentina. "His small firm with just a few employees was doing electrical, telephone, heating and air conditioning in many buildings in our home city," recalled his son and current company topper Jorge Mochkovsky. "By 1957 the situation wasn't good. Collecting the bills meant receiving new apartments as part of the payment, which he had to sell quickly and cheaply in order to obtain the cash needed to pay salaries, etc. "One day he visited a coffee shop called Derby on Calle San Luis, and found out an interesting fact," Jorge continued. "While the jukebox was playing a certain tune, two guys chose a song by Domenico Modugno which was extremely popular those days. After the current tune ended, the Domenico Modugno song was played, just once. Mauricio later recalled having thought, 'What a nice business this must be with several people paying for a service, which is rendered only once, while everybody is happy, as everyone thinks it is was played because of their choice.'" The rest, as they, is history. Mauricio asked the bartender how to get in touch with the owner of the jukebox. "A few days later, Mr. Miguel Voutto sold Mauricio his small route, consisting of three Wurlitzer operating in the Derby, Opera and Bahia Blanca coffee shops," recalled Jorge, who as a young man joined his dad in this new venture. "My job was to change records and title strips while he collected the heavy bags full of one-peso coins, and paid the 20% revenue share to the bartenders. Once a month, I had to wash the records and change needles." Two years later, Mauricio met up with a man named Fabio Tempone who had 15 pinball machines for sale. "Dad and I visited the basement where the machines were stored, and we found that the machines were in very bad shape, and had no flippers, just pins to score points when hit by the balls," said Jorge. However, they agreed on a total price of 15,000 pesos, about $200. After a few days work, the first pinball, a 1938 Exhibit's Contact, was restored and placed on revenue share basis in a bar called El Trinquete, located at a busy intersection. "Traffic was very heavy, and the machine collected in a good day 400 pesos," said Jorge. "Users openly played for money and the highest winner collected all. The cash box was very small and the one peso coins were large, so Dad had to collect the machine daily. It was a great problem to have! Shortly after, Dad realized that in view of the great collections, restoring the rest of the pinballs was a waste of time. Instead, in 1960 Mauricio decided to visit the U.S. and buy better equipment. "While Mauricio and my mother Beili visited New York and Baltimore in their first U.S. shopping trip, my job was to collect the machines and pay the revenue share," recalled Jorge. "As I was only 13, my grandfather Julio joined me as a bodyguard and for a long month, we kept the business in full operation." During that trip, and several others in the early '60s, Mauricio visited and made long lasting relationships with many industry legends including Barney and Myron Sugerman, Al Simon, Len Schneller and Sam Weissman. The first fresh machine shipment included about 30 flippers, 20 bingos and a shuffle alley. Going forward, Mauricio and son Jorge started the company began a full-scale route business, operating jukeboxes and bally bingos in bars and sports clubs all across the country. Later, sons Alex and Ricardo joined the company, and in 1969 they opened their first Sacoa Family Entertainment Center in Mar del Plata. The store was a huge success -- long before the word FEC was ever used in the U.S.
Today, the company is practically a household name in Argentina with Jorge at the helm and his sons Sebastian, Pol and Andres now making their mark of the firm's evolution. Sacoa currently operates 26 FECs in shopping malls, cinema complexes, and high traffic seaside resorts. The facilities are strong on redemption and offer many indoors rides including bumper cars, a ferris wheel, virtual reality simulators, small roller coasters, etc. The average size of their locations is 12,000 square feet, with the largest FEC measuring 40,000 square feet and featuring a dozen rides. "At our 35,000-sq.-ft. flagship store, we offer a free puppet show, which was paramount in creating a family style environment 38 years ago," explained Jorge. "A cozy tea room offers homemade apple strudel with my mother Beili's recipe, which also contributed to attracting families. Our motto back then was a direct appeal to parents, 'Play with your children.' It was a great PR move. We thought, and time proved we were right, that a place where you could see many children with their parents and grandparents would help keeping any bad characters out." Sacoa also operates a 200,000-sq.-ft. outdoor amusement park in Quito, Ecuador, named Vulqano Park. It has 30 rides, a central midway building with food court, an arcade and a special events room. This is the first permanent amusement park in the larger TeleferiQo De Quito tourist area, and since it opened its doors in summer of 2005, it has changed the way Ecuadorians have fun. "This was a great experience for us. We designed the concept, selected the rides and games, and set up the whole amusement park with the valuable knowledge of our engineers, technicians and managers," said Pol Mochkovsky, CEO of the project. "This experience set the milestone for Sacoa's consulting services in operations, now offered worldwide." In the early 1990s, Jorge realized they needed a much better way to control the business, keep track of the revenue, rotate games wisely, modify prices to compensate for inflation, and avoid theft. A solution began to take shape, and by 1993 the first Sacoa Entertainment store to replace the traditional tokens for a computerized magnetic debit card system went online. They saw an almost immediate 30% increase in revenue, prompting them to install the system in all their centers around the country in less than a year. The system's hardware and software were developed and manufactured by a sister company called Sacoa Playcard Systems, which initially supplied all Sacoa FECs and soon started exporting their system to operators in other countries. Being experienced operators and having their own locations to test new system features and see the results immediately helped in forging a sense of trust and comfort on the part of operators contemplating the adoption of the Sacoa Playcard System. "Our system is the solution to optimize the operation of FECs, amusement parks, and arcades," said Sebastian Mochkovsky. "It uses a rechargeable magnetic debit card with centralized management from a remote corporate office. "We have a high quality product backed by a prestigious company with an exemplary track record," he continued. "We show prospective customers real-life cases that demonstrate how quickly they can recover their initial investment. We also point out some of the operational possibilities open to them with a system like ours, which are completely impossible to achieve without one. None of our customers have been disappointed." The first overseas installations went in 1994 and in 1995. One of the most popular restaurant/FEC chains in the U.S. bought the card system for one test location and after only three weeks decided to have the system installed in all of the chain's stores (numbering over 40 centers today, all using the debit card system). 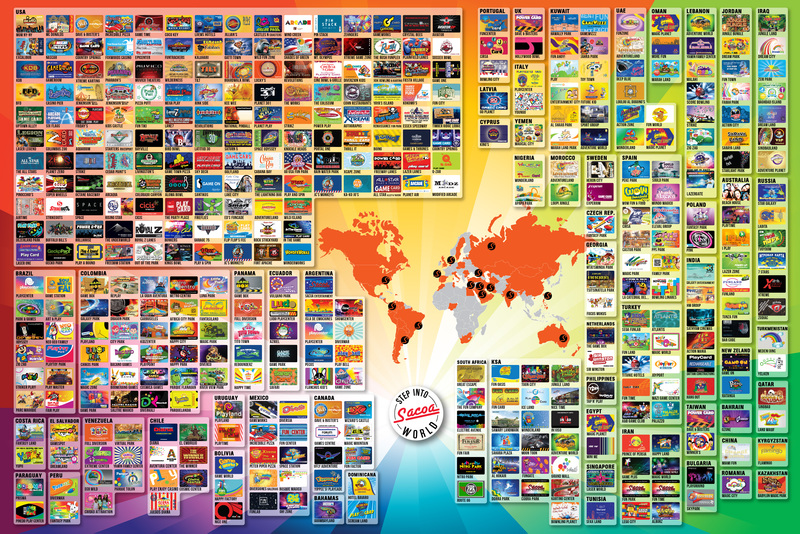 Currently there are several hundred PlayCard system installations in 40 countries all around the world. From Mauricio's and Jorge's vision, Sacoa Entertainment and PlayCard System have evolved from the early days to a three generation family business with 650 employees. Yet, the same spirit remains, resulting in a quality product backed by a can-do ethic and legacy of exemplary service after the sale. RePlay: How has the industry changed in your native country since the company was founded? Do those changes parallel the ones we have seen in the U.S. and Europe? Jorge: Fifty years ago, pinballs and jukeboxes were extremely profitable. The advent of video games in the '70s provided renewed forms of entertainment. Various periods of import bans forced us to manufacture our own games, which incidentally gave us an edge over the local competition. Later on, the influence of home video games, the networked games at cybercafes and other forms of inexpensive entertainment were a strong negative influence. Our business then shifted from street arcades to FECs in malls movie theater complexes with redemption, group games and midway games ­­ in essence a move to attractions that cannot be found at home. Who were some of the major influences on you and the growth of Sacoa? My late father, Mauricio Mochkovsky was a hard working pioneer. His vision and savvy started the company on the right track. How important is the next generation of family members, Pol and Sebastian, to the success of Sacoa today? Very. Were it not for them, I would still have to do the hard work! On a serious note, they showed early on that they had inherited their grandfather's business acumen. Tell us more about your decision to develop the Sacoa Playcard System and then ultimately to market that product to other companies? Did you go international with the product from the start? The idea of using computers to audit the operation and have statistics showing game performance was born the day we first laid our hands on a computer. Back in 1975, I personally programmed the first system in BASIC on an Altair 8800, the granddaddy of present-day personal computers. So it all started as an in-house thing to have better control. Argentina's high inflation rates created the need to change token price several times a month, which was obviously a hassle. I also noticed that video games' entertainment value dropped very fast and it sounded like a good idea to be able to set pricing with granularity not possible with tokens. I admit the idea of going international was there from the start. Just a gleam in the eye, but it was there! What is it like, being a company in Argentina, doing business with the major players in the U.S., Europe and other areas of the world? The feeling is one of achievement and pride, together with the awareness of the enormous responsibility we have to our customers. Describe briefly the core value that your product offers locations and companies that utilize the technology you have developed? They make more money. They have better control. They can invent and implement promotions, which are impossible operating on coins or tokens. Give us a brief summary of your product's evolution. We started out with a system to fulfill our own needs. Later on, feedback and wish lists from world-class operators prompted us to develop numerous enhancements to the system that became a roadmap for other companies entering the field that continue to flatter us by attempting to copy our feature set. Obviously, in the 15 years since inception, the technology we employ has evolved tremendously and led today to what is possibly the only wireless system using field proven proprietary technology. To what do you attribute your company's continued success? First and foremost, as operators ourselves, we understand the needs of the market, thus our system increases revenues and keeps customers coming back and warmly recommending us. Also, we did it first, we do it better, we never cease to innovate and add features and we strive to provide customer support and we strive to go the extra mile. Finally, our team of installers and developers are highly motivated, which our customers recognize. What do you see going forward for Sacoa both short term and say longer term over the next family generation? We firmly believe in listening to our users. Continued feedback from them will take us by the hand well into the future. © All contents of this page and the entire RePlay Magazine website at http://www.replaymag.com and http://www.replaymagazine.com Copyright 2007 RePlay Magazine. All rights reserved.